1 What actually is a stand aid? 2 Why use a mechanised stand aid? 2.3 Things to consider when choosing a Stand aid? What actually is a stand aid? Stand aids come in different forms, namely mechanised and non-mechanised. Non-mechanised stand aids require a person to be able to pull themselves up into a standing position. The stand aid provides no mechanical assistance with the transfer but offers leverage and negates the need to physically turn (whether 90 or 180 degrees) from one position to the next. Some of these stand aids come with straps to keep the person’s hips in extension to aid standing, and some have paddles that drop down behind the person in order that they can sit whilst being transferred. Mechanised stand aids can be very effective if a person can weight bear for a short period, but is unable to pull themselves up into a standing position. Slings enable a person to maintain a standing position whilst the transfer or functional task is completed. Why use a mechanised stand aid? 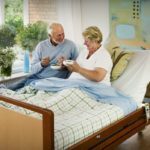 Stand aids are a great resource to aid professionals treating people who have become deconditioned after prolonged illness. People may have been weight bearing, able to transfer pre-illness however after a long period of ill health struggle. 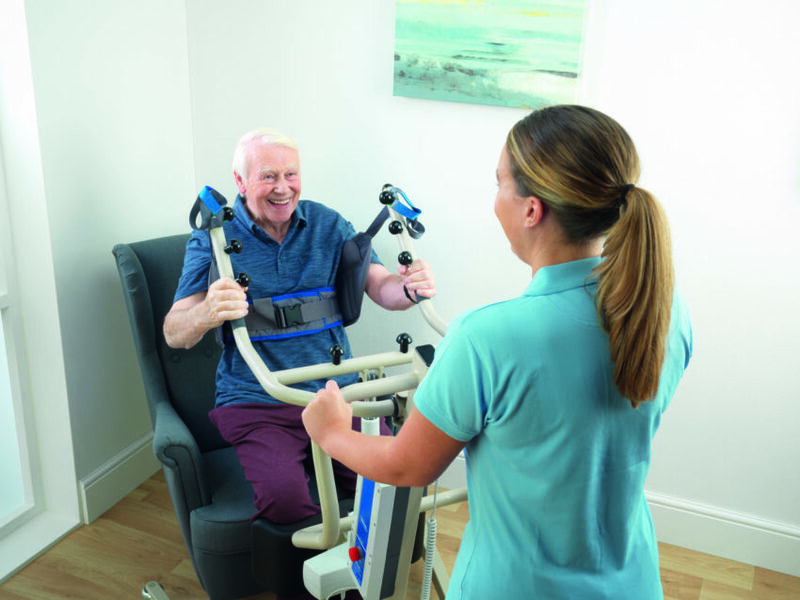 The use of a mechanised stand aids enables the professional to safely assess the person and grade the activity, getting the person used to standing again, at the same time instilling a feeling of support and increased confidence. Stand aids can also be used to maintain a person’s standing if they are struggling to stand with the assistance of two people or are unable to pull themselves up on a non-mechanised stand aid. 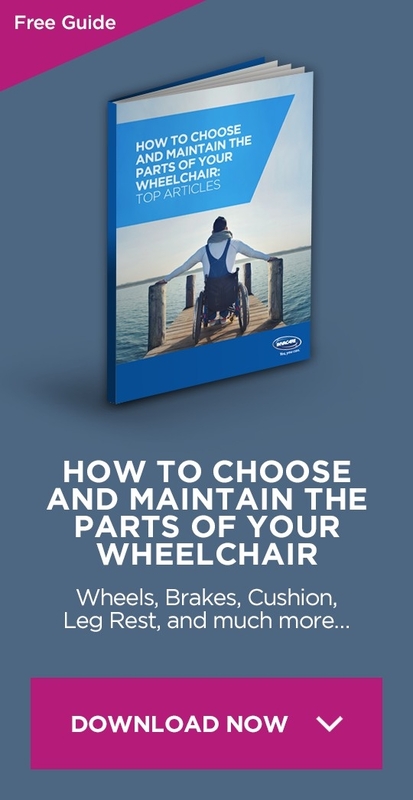 In these circumstances the stand aid is potentially an ideal solution for this purpose and can be used in nursing and residential care settings, as well and in domestic home environments alongside a risk assessment and handling plan. The Reliant 350 offers a lightweight option with a short footprint which would lend itself to a home environment. Easy operating functions, battery charging and easy to clean surfaces, make this ideal for the residential care environment. Things to consider when choosing a Stand aid? The number of plus sized patients is growing so the weight limit of stand aids has never been so important. The Roze has a weight limit of 200kg which is almost 31 and a half stone. This gives health care providers more flexibility, with the types of patient’s it can be used with. Many stand aids are noisy and have sudden movements This can make the more frail or elderlypatients already lacking confidence quite reticent to use the aid and therefore affecting their rehabilitation. The Roze mechanism is designed in a way that reduces noise and supports very smooth start and stop movement. You must first assess the person you intend to use it with; are they able to bear their own weight once standing is a pivotal factor on your risk assessment of this apparatus. I always recommend trialing a stand aid with your patient first; see how they tolerate the process. If you are in a nursing or residential care setting I would recommend getting an Occupational Therapy/Physiotherapy assessment. Also consider the person’s weight and whether they are within the equipment’s safe working limit. Where do you intend to use the apparatus? This is required as stand aids vary in length, weight, chair clearance and therefore impact on functional gains. Consider floor surfaces and turning circles to ensure no one will be put at risk. 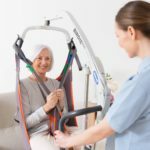 Is there room for carer support when using the stand aid? Competence of handlers; some carers may not be familiar with a stand aid and may need extra training. Overall Stand aids provide a good option to support rehabilitation and maintenance of someone’s standing ability. However, I would always recommend asking for a Physiotherapy or Occupational Therapy assessment to establish its suitability.